October is national is National Animal Safety and Protection Month. While every day our pets’ safety is a priority, it is the perfect time to highlight some tips, recommendations, and helpful hints from a 911 expert to keep our pets safe or tend to them should an emergency arise and we are unable to get our pet to a vet. 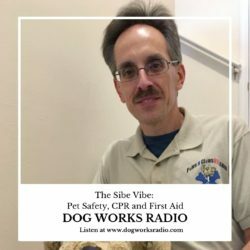 Today’s guest is Tom Rinelli, owner and instructor of Paws N Claws 911 First Aid and Care Training located in Oakdale, New York. He is a seasoned veteran of pre-hospital emergency medical services for over 25 years. With a background providing training in the classroom setting, as well as a field training instructor, Tom has received numerous life saving awards, commendations and awards including being the recipient of Suffolk County NY Regional EMS Council’s “EMS Leadership Award.” Serving as a New York State certified Critical Care Technician providing advanced life support level care, Tom has extensive field experience in both urban and suburban settings. A lifelong dog lover and owner, Tom has applied his specialized background to help Boy Scouts and Girl Scouts earn a Pet Care Merit Badge, as well as educating pet parents, caregivers, pet care professionals, rescue volunteersand first responders, including members of the United States Coast Guard, in lifesaving skills and techniques of Pet CPR and First Aid for both dogs and cats.